Condition is Used. All 4 drivers. It is also equipped with a new Polyglass cone (51/8” – 13 cm). Pulled out from working speaker. Good luck! Focal Cub 2 Subwoofer, 150 watts max, 8 inch down firing. So I want to start by saying that these speakers are 100% functional and look fantastic, but they do have several dings that I will show in pictures. Both dings are located on the rear of the speakers and can not be seen from the front or sides. It can be used in-wall or in-ceiling. It is also equipped with a new Polyglass cone (51/8” – 13 cm). A new crossover improves the off-axis listening and avoids the “shower effect”. Speakers: 5" (13cm) Polyglass Midbass. 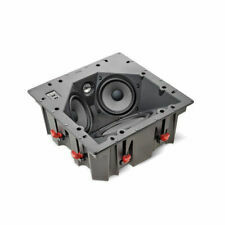 5V2352B - Focal 5.25" Midwoofer Speaker (EACH). It is also equipped with a new Polyglass cone (61/2 “ 16.5 cm). It can be used in-wall or in-ceiling. It can be used in-wall or in-ceiling. It is also equipped with a new Polyglass cone (8” – 21 cm). A new crossover improves the off-axis listening and avoids the “shower effect”. The 100ICLCR5 in-ceiling loudspeakers can be highlighted for their acoustics performances and compact design. Five possible applications: front left, center or right channels, rear left and rear right channels. Tweeter pivots 360° to direct high frequencies toward you. 8" woven flax fiber woofer with rubber surround. mounting depth: 4-3/4". designed and constructed in France. sensitivity: 90 dB. New, factory-sealed and never played! This is for a SINGLE speaker, NOT a pair -- good if you have one broken or you wish to use a main speaker as a center channel. Note I do not have the grille for it (picked it up at a garage sale). It has been tested to output clean clear crisp audio with no issues noted by the testing technician. Physically, this Soundbar has scuffing, scratches and minor dents from normal use, see photos. We keep a smaller portion of each sale. The 300ICLCR5 in-ceiling loudspeakers are made in France and are dedicated a residential use. This in-ceiling loudspeaker is perfect for very open-plan spaces without any nearby rear wall. Five uses are possible: front left, center or right channels, rear left and rear right channels. The alloy of aluminummagnesium is an excellent solution; with similar characteristics of rigidity and linearity, damping is far superior. Indeed, the nature of the material permits the design of a less concave form than in the past and which is much more favorable acoustically. Aria 948 3-Way Bass-Reflex Floorstanding Speaker. Type: Three-way bass-reflex floorstanding loudspeaker. A new type of 3-way loudspeaker with 8. The result is a more homogeneous sound improved dynamics. 8W5455 - Focal Utopia 8" Midwoofer Speaker (PAIR). CUSTOM IW 106 Product specification sheet Focal® is a trademark of Focal-JMlab®. Adjustable Tweeter level from -3dB - 3dB. Type In-wall speaker. Depth from wall 2-13/16” (71mm). Aluminum Grill (Can be painted). Another key factor: the patented EQI system, where no tools are required. The orientation of the tweeter is fully orientable in order to ensure homogenous sound throughout the room regardless of the listening point. Its superbly engineered performance and good efficiency make it ideal for use in surround speakers, mini monitors, or as the midrange component in compact multi-way systems. Good choice for MTMs, compact monitors, 3-way midrange, or line arrays. The iconic subwoofer Cub3 is designed to provide high-quality 5.1 sound. The Cub3 is a compact piece that incorporates only those functions strictly necessary to produce amazing sound. Driver: 8" (21cm) Polyflex woofer. TheCub 2 features a 150 watt Bash amplifier and an 8” Polyglass woofer. The natural choice to mate with theSib orSib XL or any small speakers for added bass impact. 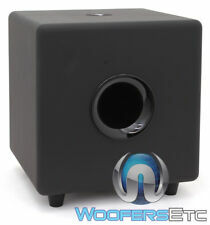 Type: 8" (21cm) Polyflex woofer. One Focal JMLab Sib XL Speaker - Gray Finish 100 Watt. For sale is a One Focal JMLab Sib XL Speaker - Gray Finish 100 Watt. Front grill in perfect condition, a few scratces on cabinet. Tested and works fine! 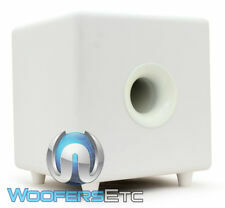 Features phase switch to acoustically match the subwoofer's output to your main speakers. We'll bend over backward to make sure you're 100% satisfied and we won't accept anything less. Up for sale is a pair of Focal JM Lab Chorus 716S speakers in great working condition. Tweeters have minor marks but no effect on performance. Speakers are nevertheless in overall very presentable condition. Midrange Driver / Monitor Speaker. Neodymium Magnet.